Ever since the Justice Lodha committee found both Chennai Super Kings and Rajasthan Royals guilty on various issues, the talks about the potential availability of the top players from these two franchises had already begun. With the suspension of Chennai and Rajasthan from the Indian Premier League (IPL) for the next two seasons this became a reality. A week back, when the Board of Control for Cricket in India (BCCI) announced the reverse bid process winners – Pune IPL team and Rajkot IPL team for the two new franchises in the IPL, all eyes turned to the draft pick which was announced by the BCCI to enable these two new teams to pick up five players each from the squads of both Chennai and Rajasthan. Earlier today the draft pick took place at the Mumbai BKC clubhouse and although there were a few surprises, the usual suspects were taken on board by the two teams.The teams had a cap of Rs 66 crores at the start of the draft and both Pune and Rajkot spent Rs 39 crores on the five players they picked. The teams were deducted Rs 12.5 crore for the first pick while the subsequent picks cost them Rs 9.5 crores, Rs 7.5 crores, Rs 5.5 crores and Rs 4 crores respectively. Sanjeev Goenka’s Pune picked Mahendra Singh Dhoni as their first choice while Keshav Bansal’s Rajkot franchise’s first option was Suresh Raina. Brendon McCullum became the first overseas played to be picked in the draft when Rajkot bagged him after adding Ravindra Jadeja. Pune picked Ajinkya Rahane and R Ashwin before picking Steve Smith in their side while Rajkot picked up two all-rounders in James Faulkner and Dwayne Bravo to round off their squad. Surprisingly, Shane Watson was not picked up by either team who also steered clear of picking any uncapped player. Pune had the first choice in the draft, since their team bid was the lowest and then the two franchises picked alternatively from the 50-player pool. Pune – MS Dhoni, Ajinkya Rahane, Ravichandran Ashwin, Steven Smith and Faf du Plessis. Rajkot – Suresh Raina, Ravindra Jadeja, Brendon McCullum, James Faulkner, Dwayne Bravo. The franchise names will be announced in the coming weeks with the team captains perhaps being named after the main player draft is concluded in February 2016. 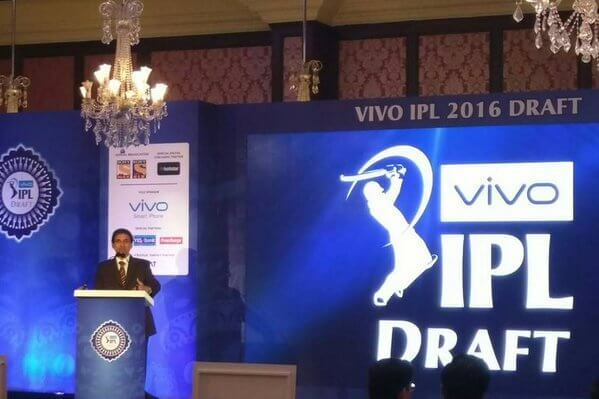 While 10 players will join their new teams post draft for a two-year period, the remaining players will automatically enter the IPL player auctions along with those released from the other six teams. The auction will be held on 6th of February in Bangalore. The IPL franchises will have to shell out the following for each of the 5 players from their purse of Rs 40 to 66 crore. When an event as massive as the Indian Premier League takes place, there has to be loads of ‘Masala’ right from the outset. The next 2 seasons will be pretty exciting as the 2 new teams get a completely new look with loads of players changing teams and loyalties breaking.